The club’s old email address is still not fixed (although we are still working on it), so we have set up a new permanent address for the club. Please update your address book(s) with the address on the contact page. The November general meeting will be held in two weeks time: Wed. 18th November, 8pm in the clubrooms. Minutes from the September general meeting are now available on the members’ page. Also, the club Christmas party will be held on Saturday 5th December. A running afternoon is planned (from about 2pm) followed by the usual BBQ from 5pm (BYO meat and drinks, everything else supplied). Friends and family are welcome too! 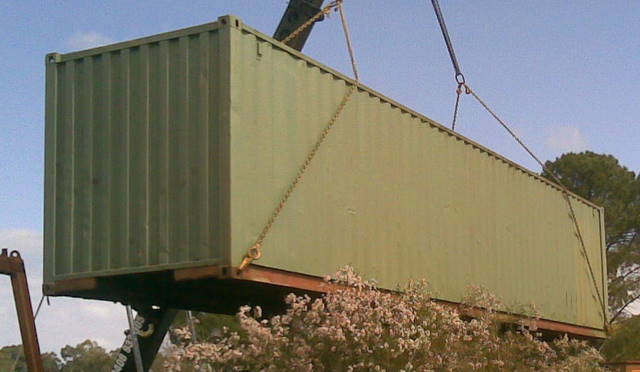 The long‐planned‐for container has finally arrived and has been installed behind the clubrooms. When I was last at the club rooms during the busy‐bee last Saturday, it was all hands on deck painting it to match the clubrooms, installing a door through into the main clubrooms and welding supports in place internally to support the work benches. This is a fantastic addition to the club’s facilities and credit must go to all those who have been involved — particularly Harry G. for finding the container in the first place, Paul H. for organising transport and the crane and Mark B. for negotiating access through Bradkens and being the driving force behind the subsequent modifications. A brilliant team effort! This year’s annual RailFest at the museum is only a few weeks away. We’ll be doing our usual thing on the day (same as a normal Sunday) only with more G‐Scale trains running outside — plus the opportunity to have an escorted viewing of our N‐Scale layout ‘behind the barricade’ for a gold coin donation. 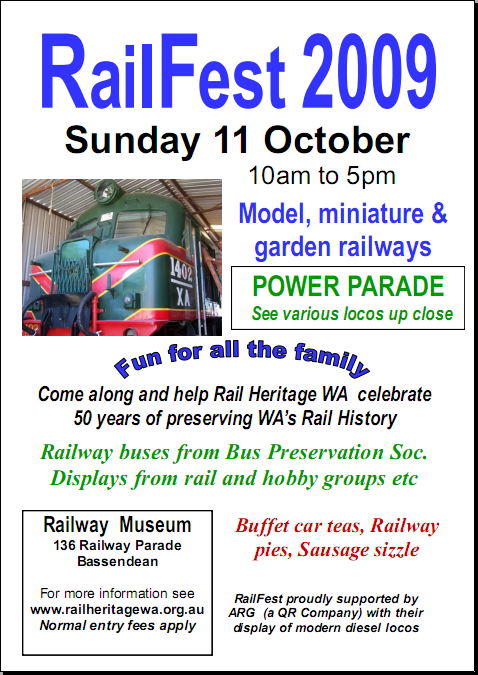 RailFest is always a great day, so come along and be part of the fun! Members: As discussed at the meeting last week, we are having a formal busy‐bee on the morning of Saturday 3rd October (i.e. 8 days before RailFest) to get the place neat and tidy. BBQ lunch will be provided by the club and the afternoon has been set aside for a chance for us all to get together and run some trains. Please come down to the club and be involved! 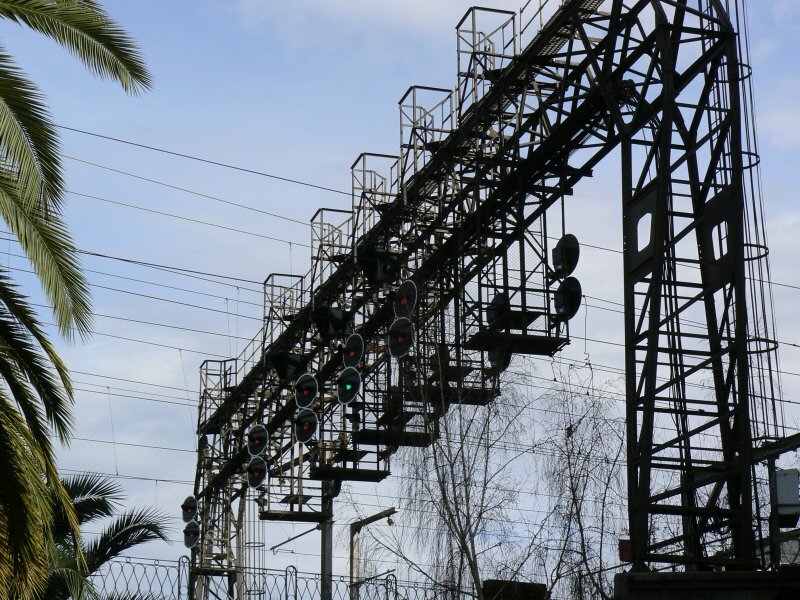 Image: Impressive (and rather ugly) signal gantry on the southern approach to Southern Cross Station (formerly Spencer Street Station) in Melbourne. This is on the Flinders Street viaduct near the intersection of Flinders and Spencer Street and the picture was taken from the entrance car park of the Grand Hotel — formerly the head offices of the Victorian Railways. You can now subscribe to the WAMRC News blog (i.e. this web page). 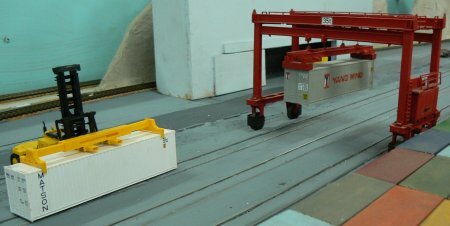 On the home page (http://www.wamrc.org.au/) you will see a yellow box in the top right hand corner of the page with options you can click on for subscribing by email or RSS. Email is the easiest and simplest option — simply enter your email address and you will get an email whenever a new post is made on the WAMRC News blog (no more than one per day — if there is more than one update per day, they get aggregated into a single email). This is a great way to stay in touch with the club’s activities and ensures you don’t miss updates to the web site. And it is secure — there are no ads or spam in the email, and your email address remains confidential. It will not be used for any other purpose whatsoever — guaranteed. Do you have some photos, news or stories you would like to share with other club members? If so, please send them in to the club secretary (email address available on the contact page) and we can put them on the web site. Would you like to help with the web site directly? If you would like to contribute directly to editing and maintaining the club’s web site, please let the secretary know. Many hands make light work and it is a great opportunity to learn some new skills! No special equipment or software is required — if you can access the internet and have a web browser you already have everything you need — and training can be provided. Back in May I travelled to Port Hedland for a single day with work. My duties were finished by mid‐morning so I had the rest of the day to wander around taking photos. The picture above is one of 134 I took in the space of a few hours!